Well, I know Mother's Day is a over a month away but I wanted to get ahead on some projects. 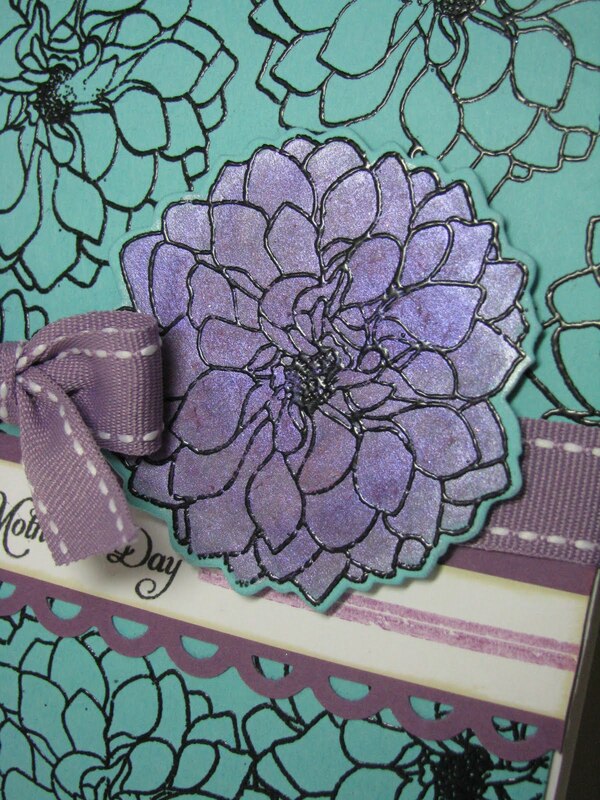 I have used the Delightful Dahlia stamp set from PTI. 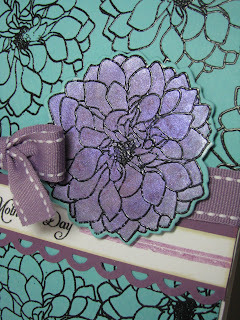 I did break out my embossing powder and my Stargazers Watercolor Palette. I have forgotten how amazing the color is with these! I tried to capture the shimmer of these paints in the photo. 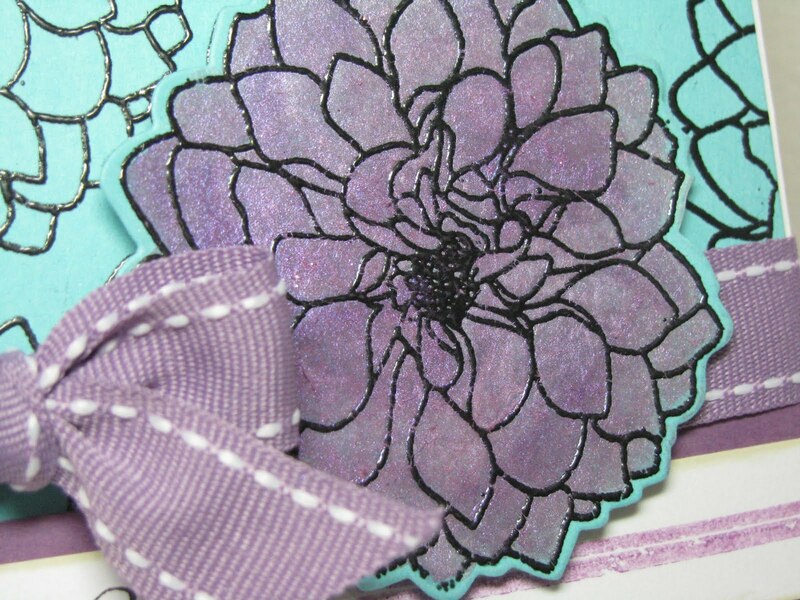 Here are the close-up shot of the flower colored with the Stargazers Watercolor Palette. Can you see the shimmer these paints give off? These work best if you've embossed your image first so that your paints don't run everywhere. The flower really does match the ribbon and ink fairly well! 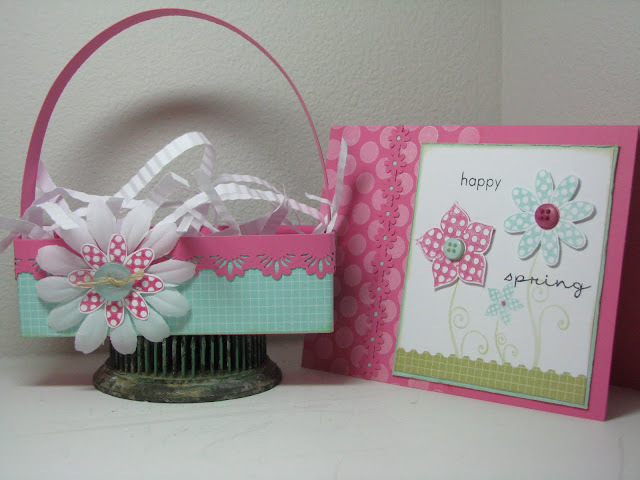 I just fell in LOVE with this stamp set called Beautiful Spring from There She Goes Stamps! It combines both the spring flowers that I just love to see popping up during spring. 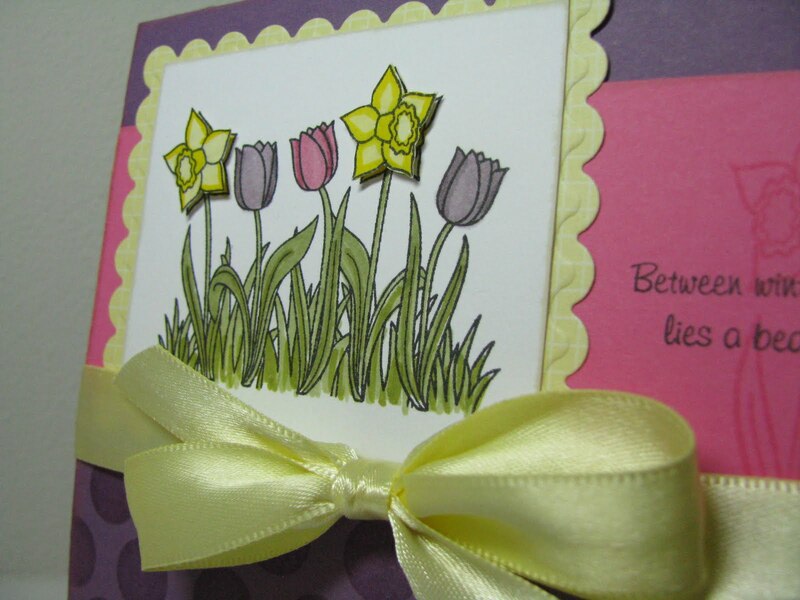 I am loving the sentiment here......"Between winter and summer, lies a beautiful spring." The image was colored in using my Plum Pudding copic trio, Ripe Avocado copic trio, Scarlet Jewel copic trio (all from PTI) and the yellows were from my "ancient" SU marker set. 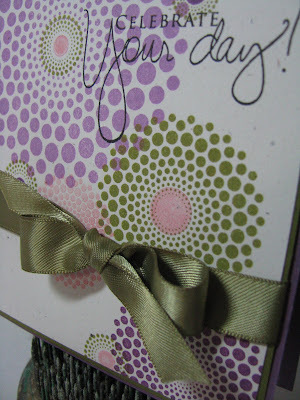 Do you see that the edges of the Plum Pudding cardstock base are a little pink color? I used my Tea Dye Duo inks to ink the edges and that's what happened....I kind of like the effect! Ribbon is a VERY close match to Lemon Tart but was from Michael's. Well here in Kansas, we are getting some of this "spring" like weather!! Yay!! I made few quick 3 x 3 cards for my kiddos for their mailboxes for Easter morning! I love how the PTI dies coordinate with the stamps! It makes creating....that much easier! 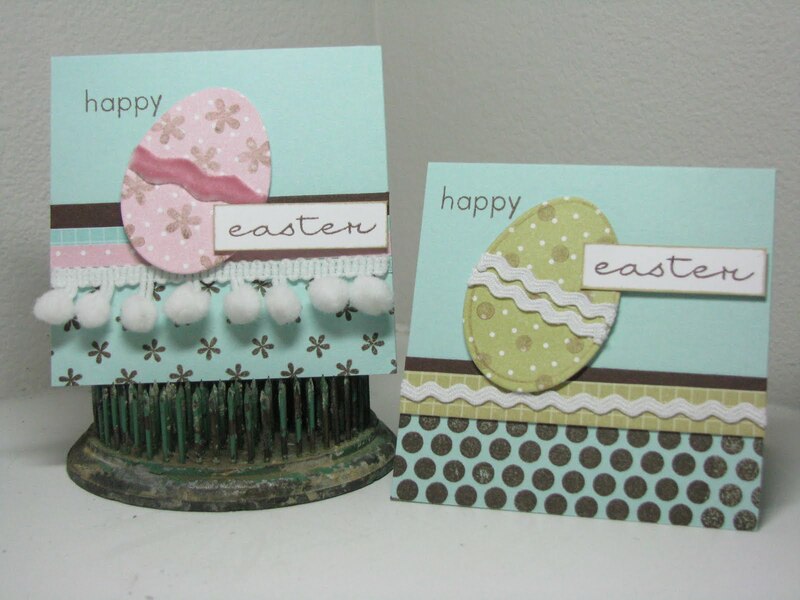 These cards use Egg Hunt from PTI. 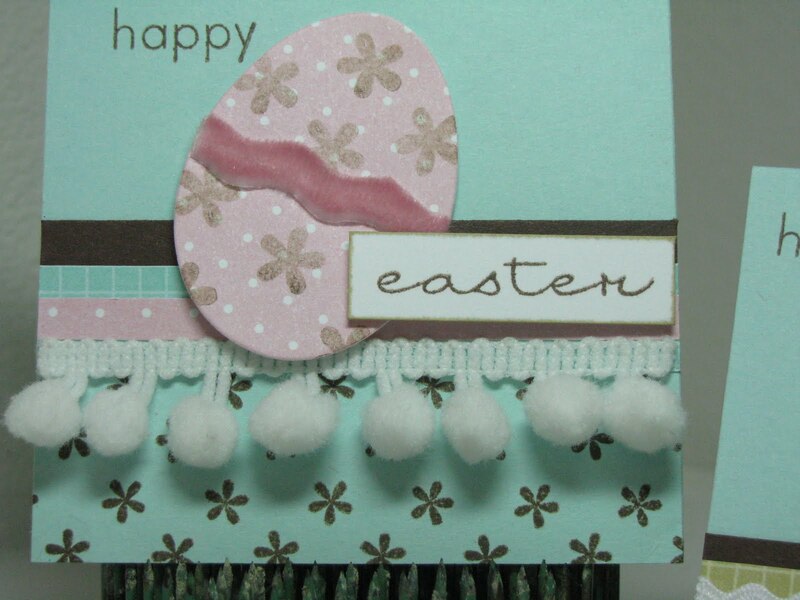 You know it was really hard to make a pastel Easter card for a boy but I think I worked it out! I got a chance to use some new trim I picked up at Archiver's a while back. The pink rickrack trim is actually fuzzy.....really cool. 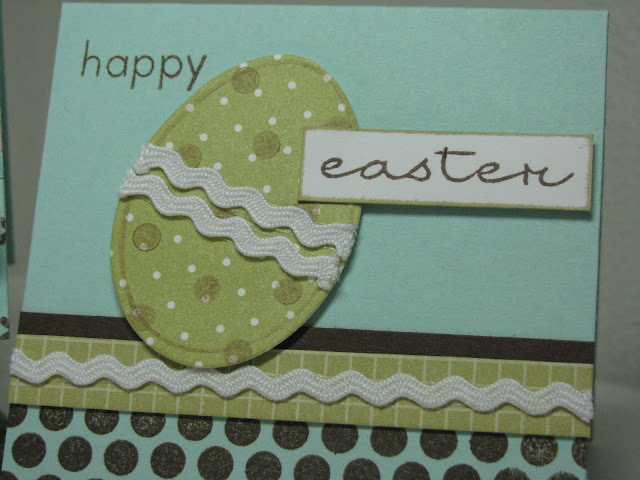 The eggs and the word "easter" are popped up on a really thin pop dot.....Just enough dimension. Well, this is a short one for today! 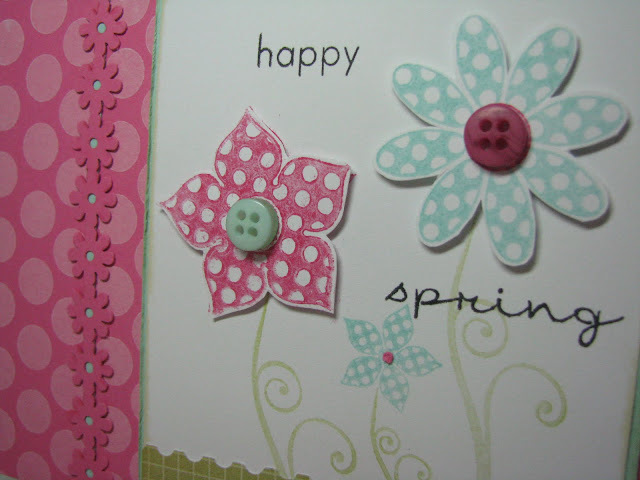 Have a great spring day! I have had so much fun making more Button rings! 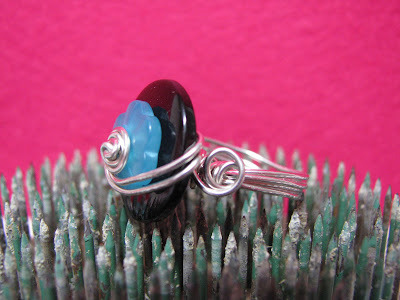 Here are 2 more rings I made since the PTI blog hop. 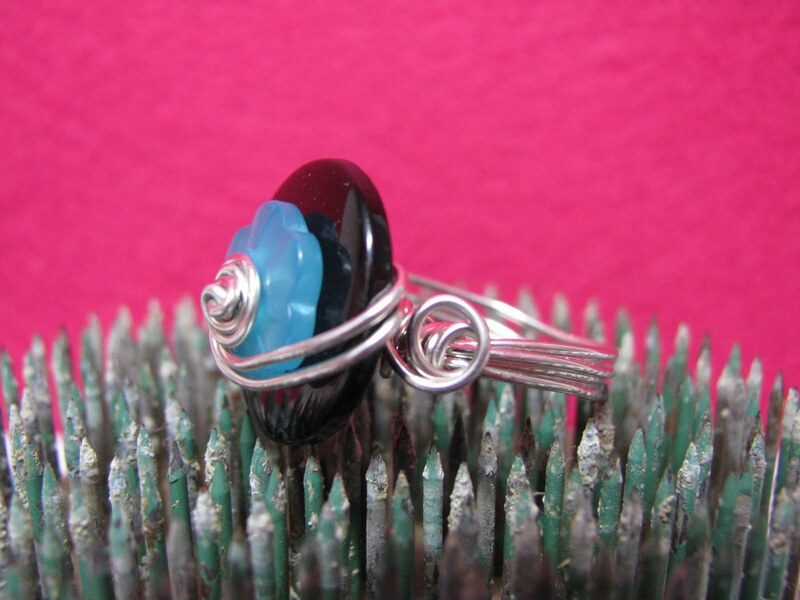 Here I've made a ring for me and a ring for my daughter! Again, using Hawaiian Shores and True Black buttons. This time I used shape buttons as the centers and added decorative swirls on the sides to "hide" the wire wraps. Here are some other shots of the rings. Enjoy! 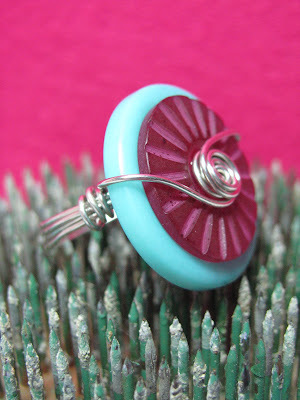 I am now off to make some more button rings in other PTI color combos! March 2010 PTI blog hop time! inspiration we will gain from each other should prove to be truly enticing!" 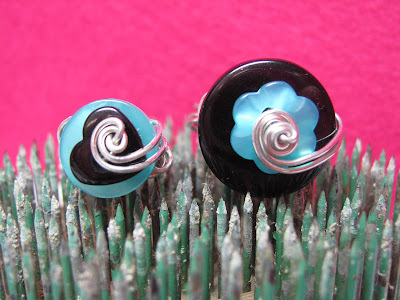 Now, I created a few things with my new Hawaiian Shores buttons for this challenge! 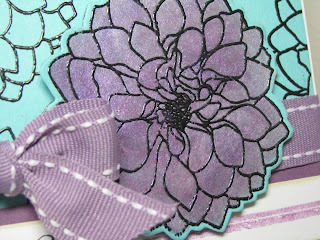 First off is a card using the new Beautiful Blooms II dies with felt!! I am sooo lovin' these dies!!! 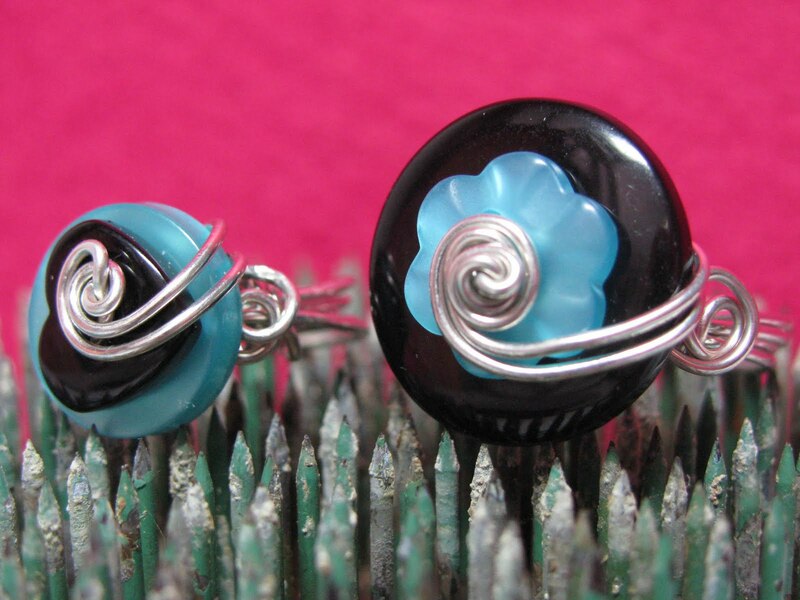 The flowers are attached with Hibiscus Burst and Hawaiian Shores buttons. 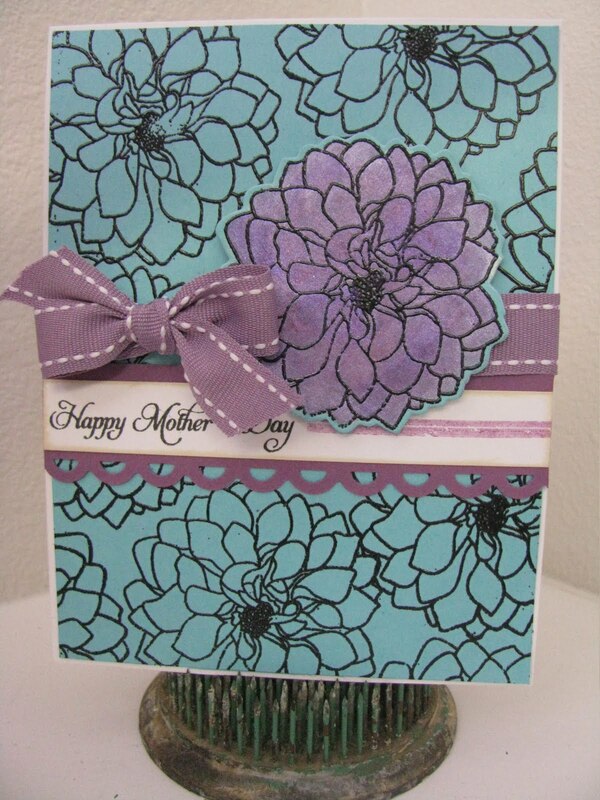 This card also uses the new set: Distressed Stripes. 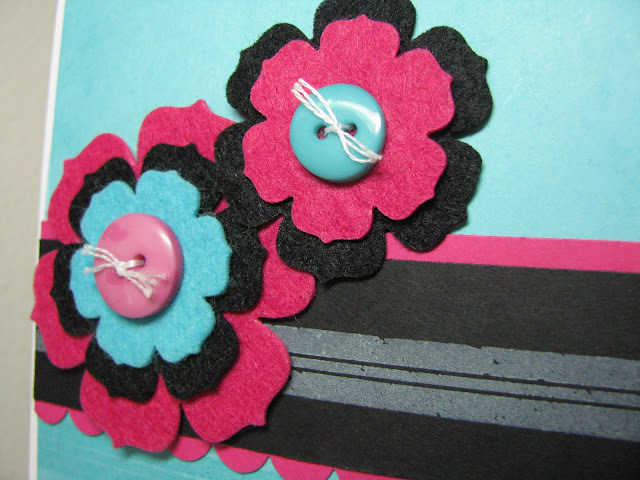 Here is a close-up of the felt flowers......the black and pink felt are from Hobby Lobby and are on sale this week! I only had to run the felt through my machine once and look how beautifully cut they are! Now, I have a confession to make here. 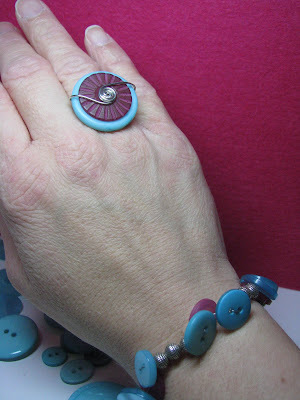 My friend, Jen from JensInkSpot, and I were discussing what we were making for the Blog Hop and she mentioned her button rings she had made (I totally don't want to steal her thunder). We both had bought a ring or two from a good friend and fellow stamper, Heather Scott last year at the annual TAC Seminar. 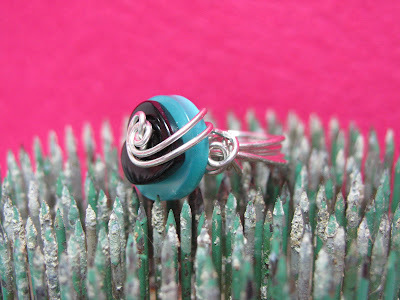 I instantly fell in love with these rings she was making (I think I bought 4 rings from her)!! So, Jen told me of a Youtube video to watch and whalaaa.....a button ring!!! Years ago, I used to make beaded bracelets so I dug out my tools, beads, etc. and went to work. 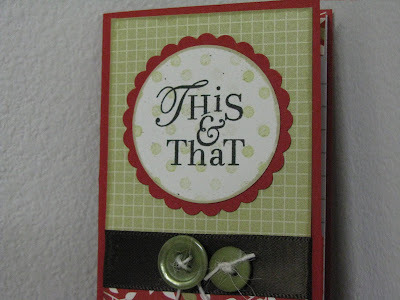 It really was soooo simple especially when you have such beautiful buttons from Papertrey Ink to work with!! Now, remember this is my FIRST button ring.......it is by no means perfect but I am so happy with it!! 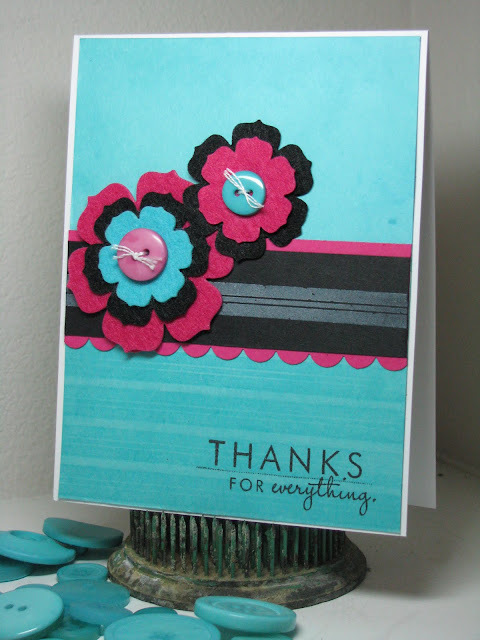 The color of buttons I chose to work with were Hibiscus Burst and the new Hawaiian Shores. Isn't that Hibiscus Burst button just gorgeous!! Well, I couldn't just stop there, now could I? Please remember that in this next photo, I am a nurse and do have nurse hands and am by no means EVER going to be a hand model!! So, I went ahead and made a matching bracelet!! 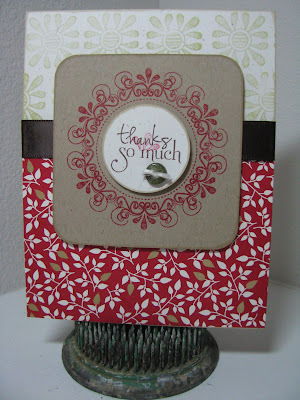 Well, that's it for my contribution to the March Papertrey Ink Blog Hop!! Have a great time blog hopping and we'll see you next month!! A few weeks ago, I broke down and bought a stamp set from The Stamps of Life called thanks2you. 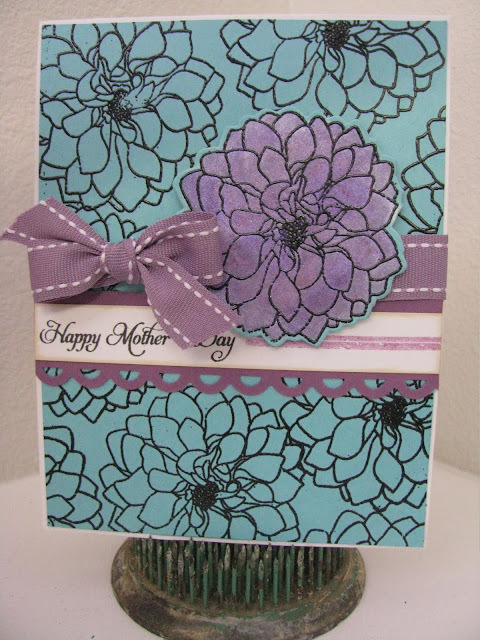 I couldn't wait to get this set and cut the stems off and stamp away! I had a need for a thank you for a dear friend of mine, so one of the sentiments in this set was fitting, right Laurie? On with the card!! 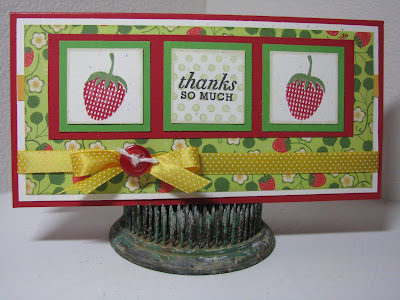 I used Pure Poppy, Spring Moss, and Berry Sorbet for this card. Likin' this color combo too! The sentiment came from this stamp set as well. 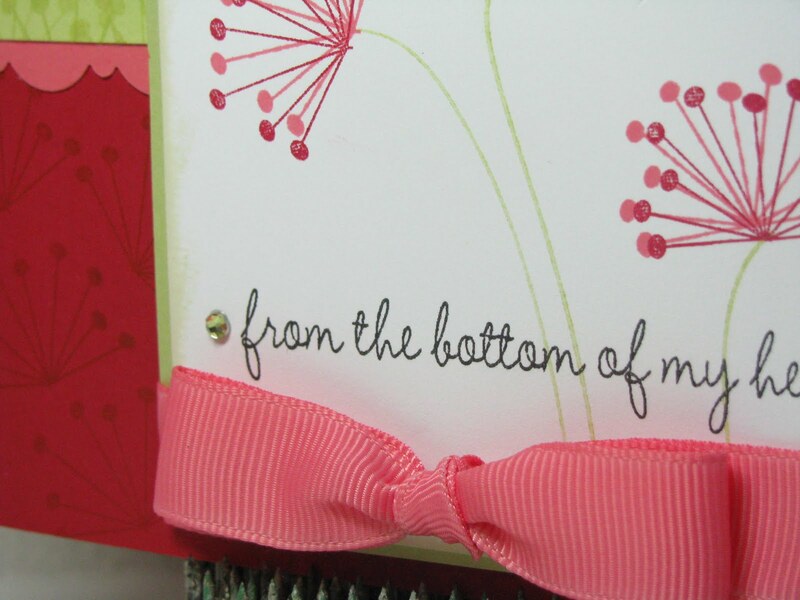 The inside uses the sentiment "you rock"! Laurie's favorite part! Here is a close-up of the flowers...I found I need to trim my flower stem off the flower just a teensy bit more. With the addition of some light green moss rhinestones and the Berry Sorbet ribbon bow, just finished this card off. So what do you think? I would love to read your thoughts on this card!! 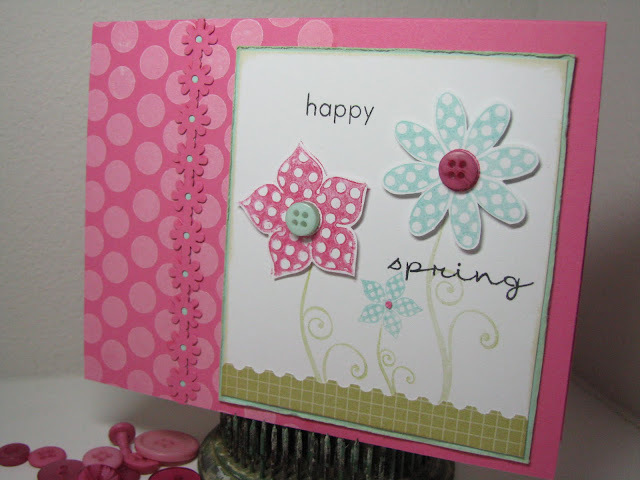 It sure hasn't felt like Spring here in Kansas (we received several inches of snow over the weekend), but I do have a Spring-themed card and project to share as part of a blog hop that I am participating in! Scroll down to the bottom of this post to see the entire list of participants and make sure to click on their blog and check out some Spring things! 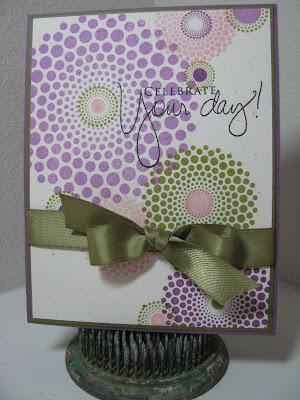 The card I created uses Polka Dot Basics II from PTI and a stamp set called Polka Dot Blooms by There She Goes stamps! I finally broke down and purchased this mini set and it is just so cute! I have been eyeing TSG stamps for awhile now and definitely will order more....good quality and fast shipping. Here is a close-up of the images. 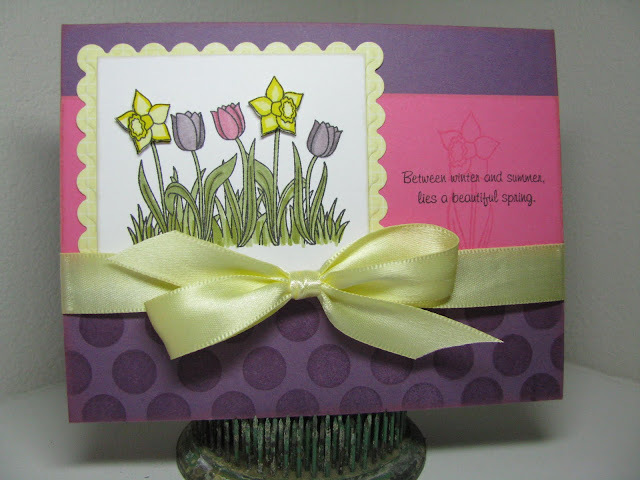 I did use the "happy spring" from the stamp set Egg Hunt by PTI for the sentiment. 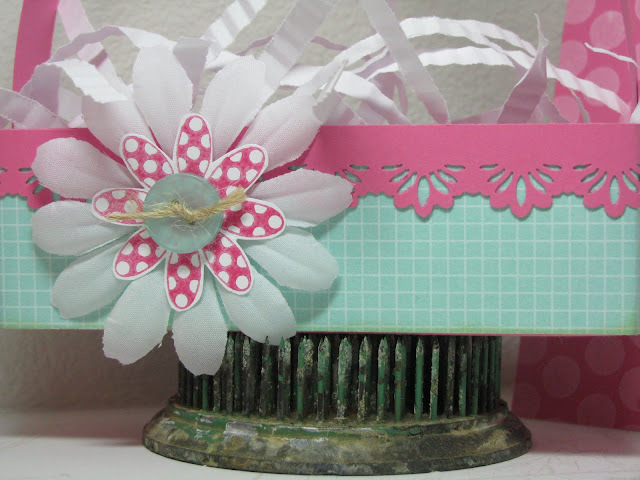 The flower punched border is a new punch by EK Success and I added a tiny Aqua Mist strip behind the flower centers! Ok, now here is a picture of the entire Spring project! I just love how it turned out! I made a tiny Easter Basket using this video on SplitcoastStampers. 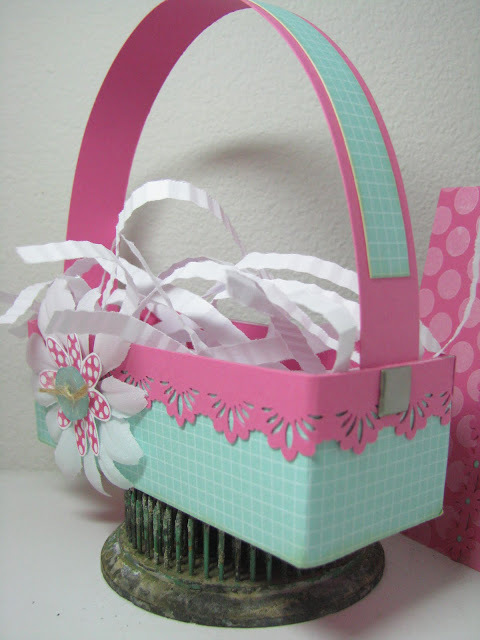 Here are some other pics of the basket.....was very easy and my daughter said, "Is that for me?" How cute was that?! I told her I will make her one! So, what do you think? Springy enough for you all? I am loving these colors together! Aqua Mist and Hibiscus Burst! Alright now, here is the list of all the other participants in this Spring themed Blog Hop! 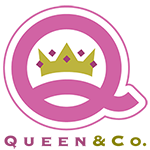 Go check them out and don't forget to leave some love!! Happy hopping! I wanted to wish everyone a Happy St. Patrick's Day today! I will be having fun in the St.Patrick's Day parade later this morning here in downtown Topeka! I am going to be on the float for 94.5 Country Radio station where my hubby works. I just didn't think that I could manage to walk the route with being sick lately. Here are my kiddos cards I made them for their little mailboxes! I used Nichole Heady's little trick with the frame stamp for the lines from Luck of the Irish by PTI. I have some playing around with it yet to do because I didn't get my lines lined up quite right to get every other color, KWIM? Hence, the two yellow lines together! Anyway, my kiddos won't notice!! 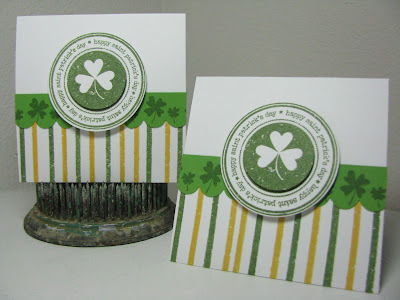 I also used another St. Patrick's Day stamp set that I had bought a long time ago at JoAnn's. 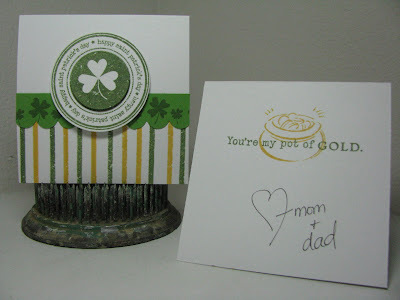 The clover border and pot 'o gold on the inside of the card came from this set. I just love this little saying "You're my pot of gold!" These cards for my kids mailboxes are 3X3 size.....just perfect! Have a wonderful St. Patrick's Day! Don't forget to wear green!!! I have been MIA from my blog and well, some of you know that I haven't been feeling too good lately. I have been down this past week with pneumonia and am still coughing my lungs out but I am starting to feel better. But let's get on with a post for my blog today! Shall we? I think I just love Kraft and Pure Poppy together with just a touch of Dark Chocolate! 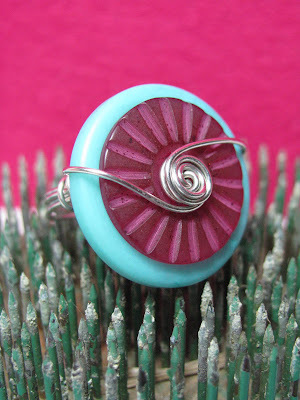 Can you tell with this last picture that the small circle and the panel have been inked with the Tea Dye Duo from PTI? I just love these ink pads and can't wait until they get refills for them! I would love to hear what you think! Have a great Tuesday! 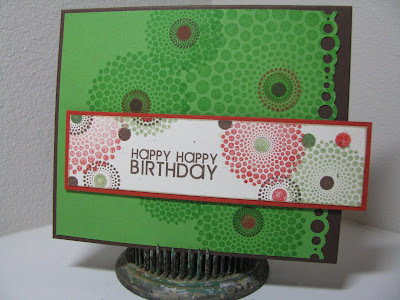 I thought I would try another card using Spot Dot......but this time in masculine colors. After seeing Dana's card here...........I had to try those colors. I am not too happy with the New Leaf Background but I didn't want to redo it. 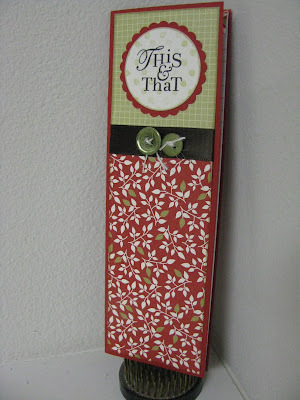 However, I am happy with the sentiment panel!! I had fun using oanother one of my new EK Success punches called "Bubbles". Sweet Sunday Sketch Challenge 58! One of the things I wanted to do more with this year was to participate in more challenges! 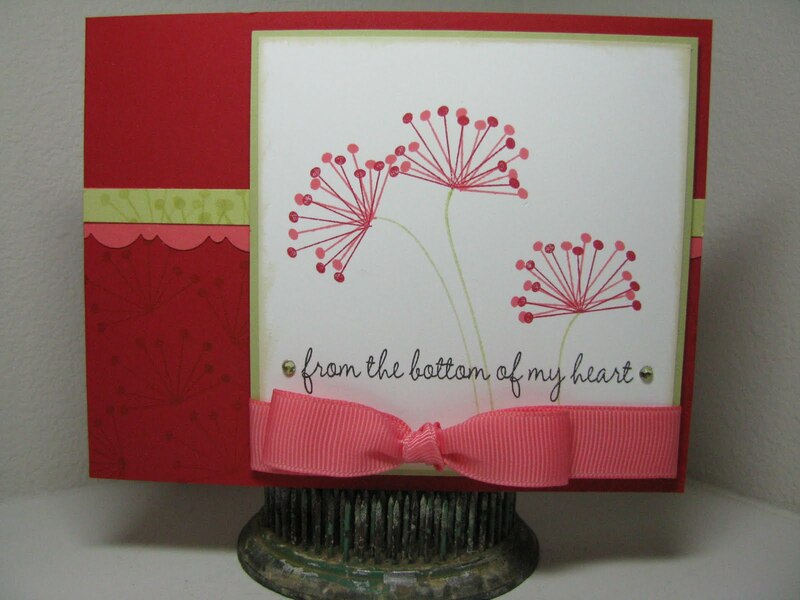 Here is my card for the Sweet Sunday Sketch Challenge. I had so much fun with this one and used a different card size (6.5" x 3.25"). The same size that Karen used on her card for this challenge! I used the Cosmo Cricket Garden Variety mini deck paper for this one and busted out my Fruitful PTI set too! Here is a close-up version. 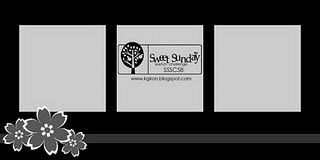 Here is the Sweet Sunday Sketch Challenge......check them out! I wanted to show you a ca-yoot notebook! I LOVE these things but I have yet to make one for myself!! 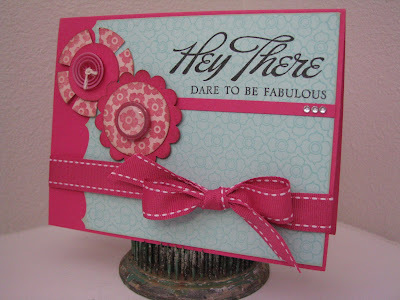 I really like this one....made for a good friend who hosted our Stampin' Away weekend. This was the first time using the Green Tea Leaves paper from PTI!! It sure packs a punch with color! 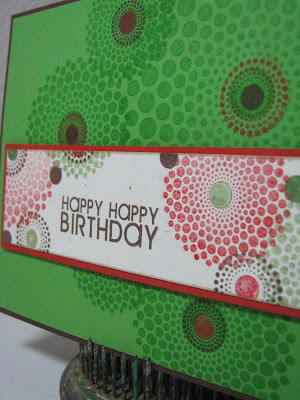 In the close up pic, you can see how I used Spring Moss ink on the stamped circle and then "This &That" stamp over the top.......I really like the subtleness! 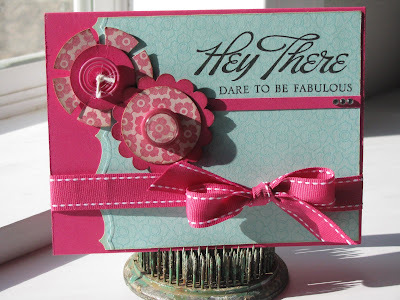 I don't know about you but I was not SOLD on this set when I first saw it but once I started to see those DT girls at Papertrey Ink create with it.........i WAS sold!! Realizing there would be so many possibilites with it, I put this stamp set in my cart!! Boy am I glad I did! It's great! Here I used a favorite color combo of mine: avocado and purple! I don't know what it is.....just a favorite! Look at these embellies I got in the mail! If you are coming here from my old blog address, WELCOME!! 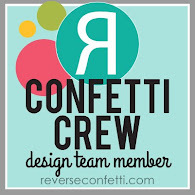 I thought it was time to give my blog a more official "name". 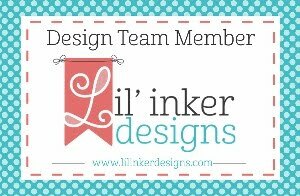 I am going to enlist the help of a friend that does design work to help me out with a blog header using my new name. Hopefully, this will be soon! Now, on to the reason for this post! 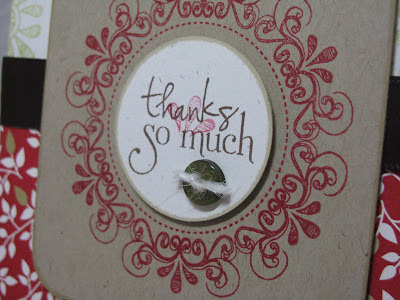 I received some super sweet embellies in the mail last week from the very nice Melissa Ladd at Melissa's Paperie! I commented on them on her blog and she sent them to me!! Here is a card I made with some of her embellies! I REALLY like how this turned out! I did realize however, that I must be on a Raspberry Fizz kick! But hey, who doesn't like pink, right? Oh my, look at this sunshine!! It's just wonderful! I am showing this shot because you can see the detail of the new EK Success border edger I found this weekend at my local JoAnn's! Thanks to some of my enabling stamp friends....they alerted me that they were in!! Love you gals!! Anyway, this border edger is called "bracket" and also embosses! Oh, it's just heavenly! 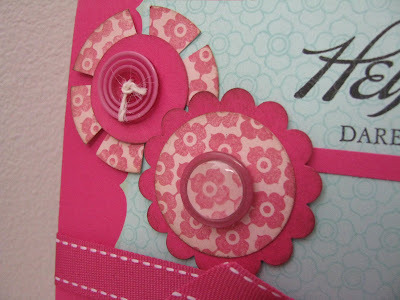 Here are Melissa's embellies close up on my card!! I just love the scalloped flower one that uses a button as its center with an epoxy circle over the top of a small stamped/punched circle!! Love this look! I can't wait to use the other 2 embellies she sent....it was hard to choose which to use! Melissa also sent me a very pretty stamped card along with these beauties......Melissa if you are reading this, THANK YOU!!! My plan today is to start cleaning and organizing my stamp room! It is such a mess! 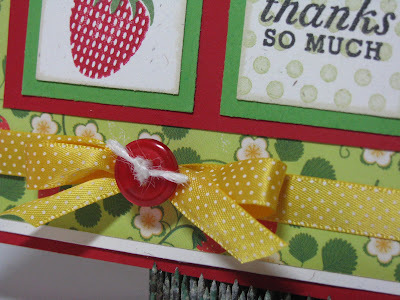 Misc: Bracket border edger (EKSuccess), Raspberry Fizz ribbon, rhinestones, Melissa's embellies!